I took some very simple measurements from my recent experiments with Silverlight and WCF web services. These are so simple and unscientifical that I suggest you take them only as a general indication. Please test your scenario to get an accurate picture! You can see that text formatter is incredibly slower than binary XML. One interesting thing I noticed is that this extreme slowness of the text formatter happens only with Silverlight (3). That is, if you use a Windows client (console app or wpf), text formatter is still slower than binary formatter but not that much (compare the red bars). The Silverlight runtime is probably slower than the Windows runtime and I guess that deserializing a huge xml message is one of the things that clearly expose this difference. 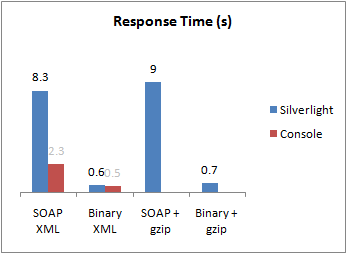 Another observation is that with gzip compression the response time is slightly slower. Keep in mind that these numbers come from a connection on a single machine. In real world, with a large message, size will be so much smaller with compression that the compression overhead is probably largely compensated. 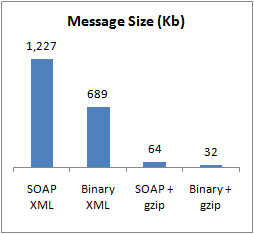 The message I used was quite large and included a pseudo-dataTable. This means that XML serialization results in a lot of string repetitions: a particularly good target for zip compression. Other cases may not benefit so greatly from gzip compression. This is clearly not a conclusive test -it may not even be enough to be called a test- but one thing is clear: it is worth it spending some time to play with the different binding options as the benefits you could reap may be huge.